Kafka always has an aspect of the grotesque in his stories, as well as the bizarre. Of course I've read The Metamorphosis, but I've also read "In the Penal Colony", "The Hunger Artist", and "The Coal-Scuttle-Rider". I enjoyed these three more than The Metamorphosis - I really couldn't get past the fact that a disgusting bug was narrating. lol. I'm impressed that you read one of the stories in the original German! Great job. I wish I knew another language well enough. Back in the day, I knew French well enough to read the Little Prince in its original language. Stories always lose a little something in translation, I think. Julie - Metamorphosis was more bizarre and like you said, disgusting than these stories, though! 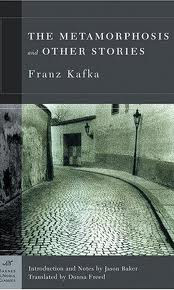 I've never tried Kafka before. But these stories you've mentioned sound very interesting...especially the one about the ape. I should really see about getting a hold of his short stories...I find it's any easy way to get introduced to a new-to-me author. Risa - Thanks for stopping by! And you know what, the story about the ape is actually a great way to start reading Kafka, it's not as disgusting as the rest and it's still very "Kafkaesque"!